I'm going to try to make this quick (I think I've said that before!). We have been out of town, as my sweet mother-in-law passed away last Tuesday. She lived in North Dakota, so we have been there with family for a few days. It is sad that she is gone, but it was so nice to see all of the family again and to make some new memories with them. My daughter hasn't ever been able to spend much time with her cousins, so they had a blast. There was a giggle fest that still makes me laugh when I think of it! And these girls are ages 20 and 24...not little girls! They were so funny. But, back to my MIL. She was a quilter in her day, and I was lucky enough to be able to finish a quilt for her that she had started. It is something that we will always treasure. Again, it is hard to know that she is gone, but also comforting that she is at peace now and with other loved ones who were gone too soon. Enough sadness...I also wanted to show you the fabrics that we will be working with in Omaha at More Sew For You - with Lyn and The Crow Girls. (You are all signed up, right?) It's my understanding that there are only a couple of spots left, so you aren't going to have much of a chance if you don't HURRY! I can't even put into words how yummy and rich these fabrics are. Lyn sent them to me and I was sooooo pleased when I opened the package. They really are gorgeous. And what am I doing with these???? Well...if you are in attendance you will find out! Could be some special offerings for class attendees! 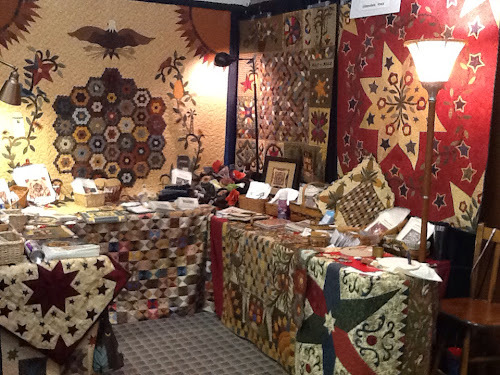 Don't forget that my friend Missie, from Hallbrook Designs will also be in Omaha - she will have a display of her awesome quilts (and much more) and will be offering her patterns for sale. If you have not seen them - be prepared to be wowed! She has some really great designs. One other thing - I was notified by a customer that they were having trouble on my website, that when they put items in their cart and attempted to checkout, they kept getting bumped back to the home page. I am told by Intuit that this problem is corrected, so if anyone has any other trouble, please let me know! Ok...I said this would be quick - so now I have to get back to work! Sarah from Sarah Did It blog reminded me that it is Feline Friday, and we know I always have cat pictures to share! That is Callie, when she was itty bitty. Yes, it looks like all is well, but do you believe it? And yes, it looks like Callie is a sweet kitty and is giving Ozzie a little bath. And even Ozzie is buying into the sweetness. And this is just funny! I think he's gonna get her! And Miss CC - pretty kitty. Still miss her lots. Thought I would show something quilty too - it has been a looooong time since I posted any of my Civil War Love Letter blocks. I haven't made any of these forever, but I did find a few that I hadn't posted yet. I really do love these blocks and want to make some more! Do you have all of Rosemary Youngs' books? I love them all - and she's working on a new one! And one last thing - if you haven't signed up for the classes in Omaha with The Crow Girls - go do it! Find all of the info on my last blog post. It's gonna be so much fun!!! Let me know if you are going - and make sure that you are NOT a "no-reply blogger" so that I can reply to you! Congrats girls - I will mail them out to you just as soon as you send me your addresses! Hope you like the magazine - and let me know if (when!) you make something from it! Thanks to everyone for commenting and for following my blog! I had several people who left comments that are "No Reply Bloggers". I always reply to all comments, so if you did not hear from me, it is because your settings are "no reply". Please change that so I can answer you!! I noticed that I have over 200 followers, so I thought I would have a little giveaway! The winners (there will be two) will receive this issue of Simple Quilts Magazine. There is a ton of different projects in here, including the pattern for Poor Lil' Punky - my pin cushion that is shown below. All you have to do is !) be a follower and 2) leave a comment, and I will pick two winners (with the help of Callie and Ozzie) on Monday. The Crows are flying in! We are back and almost recuperated from "It's A Gatherin'" - we had a great time! There were lots of people and it's always fun to meet everyone. My friend, Missie, from Hallbrook Designs was there too - this was her first show and she did great and her booth looked amazing! Go see her blog to see more pictures of her booth. I love every single one of her patterns - she gives everything a unique twist. Make sure to check out her punch needle pieces - some are coasters and others are quilt centers - what great ideas! The Crows have their own method of applique and it involves a stapler! I was fortunate enough to meet them last year at Market in Kansas City, and let me tell you...they are SO MUCH FUN! If you are anywhere near Omaha I strongly encourage you to sign up for one, or all, of their classes - you will learn lots and laugh your head off! These girls are coming a LONG way and this is an opportunity that doesn't come along very often. I can not wait! And, not only are they a blast to be around, they do gorgeous work. I have their book, but seeing all of their projects in person was just unbelievable. You can see them too because there will be a trunk show on Saturday. To get more information and to sign up for this event go to the More Sew For You website, on the classes tab, scroll down to Events. If you have any questions, the owner of the shop, Lyn, has the answers. She is working on the samples and has pulled some really great fabrics and wools for the 3 projects. You can see some sneak peeks on her blog. I know that I sound like a commercial - but I'm telling you...this is going to be a blast, and it really is a rare opportunity. I am going to be there all 3 days (have I mentioned that I'm EXCITED!) and will have my jewelry there too. And you just never know, there may be some special opportunities for class attendees! Now, go get yourself signed up! We have had so much interest in this program that we will be running it for a second year - so if you are interested in joining in on the fun, send me an e-mail and I will add you to my e-mail list so you will be among the first to receive the information on Charming 2. Can you see her head in the above picture - she is really snuggled in. Thank goodness I just got another case of lint rollers! Now it's back to the grind stone - I've got paperwork, unpacking and orders to catch up on!